Cauliflower bread happens to be the healthiest bread ever. Made from just a few simple ingredients, including cauliflower, almond flour, eggs, and spices. The result is a light, springy “bread” that’s so easy to make, you may vow to never buy a loaf of Ezekiel again. Now does it taste exactly like bread? No. Does it do the trick and make you feel like you’re eating bread? Yes. 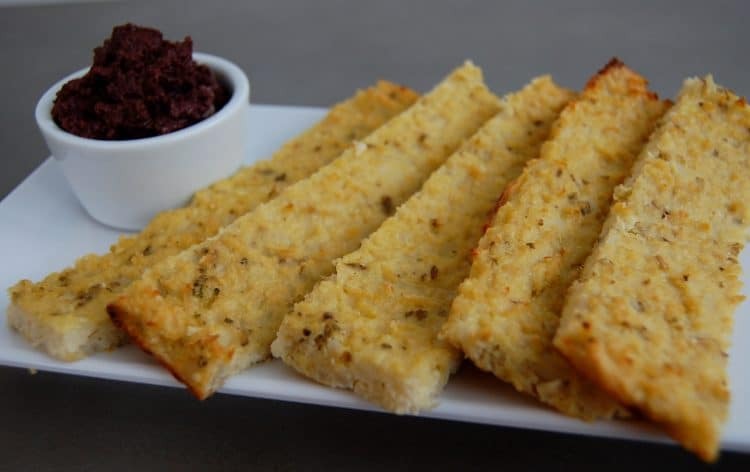 You could turn this into sandwich bread or dippable sticks. (Note that the bread is more soft than hard, so a softer, creamier dip works best, so you don’t lose your stick in the bowl). You could also spread a topping right on it. If a crisper bread is what your after, spread the batter thinner, cook it longer, or simply sear it on the stove top with a little oil in a hot pan after it’s been cut. You can also use this as a base for pizza, which I haven’t tried yet, but am very much looking forward to. 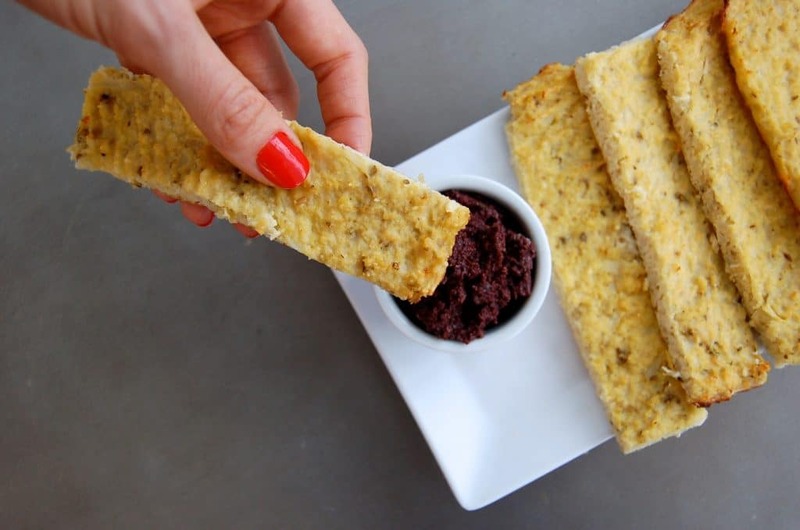 A delicious gluten-free, dairy-free bread made from cauliflower. Break the cauliflower into florets and pulse in a high speed blender on low, or a food processor until fine. Steam in a steamer basket (about 7-10 min) and then remove and let cool. Once cooled, drain well by using paper towels to squeeze out excess moisture over the sink, or put on a towel. In a bowl, combine the cauliflower with the almond flour, oregano, salt, garlic powder, and eggs. Transfer to the center of the baking sheet and spread into a large rectangle. Try to keep it to no more than 1/2 inch thick. The thinner, the crispier, the thicker, the fluffier. Bake for 30 minutes, or longer for a crispier bread. Take it out of the oven, and slice into desired size and shape. Let cool completely before transferring to serving plate. Maria, can we use chia seeds to make an egg like substance if vegan?